Just in case you haven’t heard, it’s Saint Patricks day tomorrow. For me, that means I’ll be working, wearing a ridiculous and gigantic Murphy’s Stout hat and serving people, probably, too much Beer. I’m not Irish nor do I live in Ireland, in fact, I’m pretty sure that the majority of people going out to celebrate tomorrow in Gibraltar aren’t either! But hey, any excuse for a party, right? 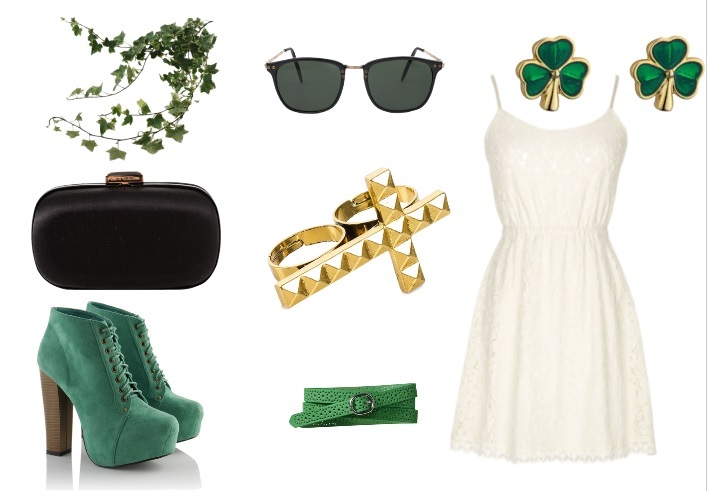 With this, I decided to pull a couple of “St.Patricks day inspired outfits” together. So if you’re stuck for what to wear, hopefully this’ll help you out. I love mint green, in fact my nails are currently “misty jade” (Rimmel come up with some right names don’t they! )﻿ This outfit might not be a good idea if you’ve got bad weather at the moment, well, unless you’re really brave, I think you might just be a little cold. Alternatively you could swap the skater skirt for a pair of high waisted skinny jeans (these would be perfect) and voila! UK safe! Keep extra warm with this one! Dry too! This would be perfect for any outdoor events you’re attending for St.Paddy’s day. I love love love this jacket and wish I could get my hands on one for myself! Basically, keeping it simple but still fab! You don’t need to go out and get the Alexander McQueen scarf, although if you’ve got the dosh you totally should, any white/cream scarf would do! Fancy dressing up that little bit more? Well then this is the outfit for you. This dress is perfect if you’ve got some sunny weather and I think I’ve fallen in love with the shoes. If you’re heading out tomorrow night, ditch the sunnies (Sunglasses indoors, at night is really not a good look, trust me) and team the dress up with a jacket like this or this and you’ll really look the part. So which of these three outfits is your favourite? What will you be wearing tomorrow? 1 reply to GET GREEN FOR ST. PADDY’S DAY!